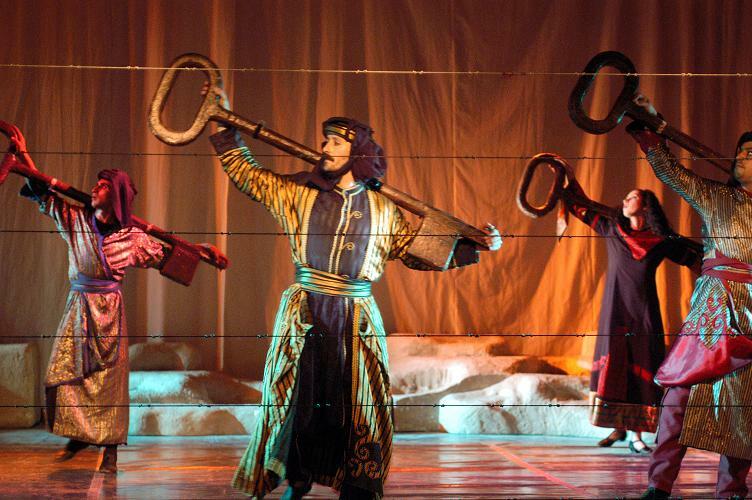 This production provided the foundation of Palestinian contemporary dance. Unlike the other productions’ themes, this work addresses a more modern question. By revisiting Palestinian modern history in this work, El-Funoun hopes to contribute to the undergoing process of reformulating Palestinian cultural identity. In order to fully realize the magnitude of social reconstruction that the Palestinian society so crucially needs, El-Funoun believes that it is imperative to prudently examine some of the most influential experiences, which have left decisive imprints on Palestinian memory, intellect and self-image. “Haifa, Beirut & Beyond” aims at shedding light on those experiences to help rearrange our social agenda. Another important objective is exposing Palestinians to more contemporary artistic expressions that defy predetermined notions of how Palestinian dance “should” be, and what themes it “ought to” address. “Haifa Beirut and beyond...” comprised of distinguished scenes. Each scene employed different accessories, set design, lighting and costumes all designed especially for the purpose of this particular production reflecting the different historic eras.